It is Dhanteras today—the day Hindus consider auspicious to buy precious metal. Considering the fetish that Indian households have for gold, this is just another reason to buy the precious metal. If you have plans to go buy gold today, there is a checklist of things that we want to arm you with, especially if you are buying jewellery. Here are five things that you need to look at before you buy that piece of gold jewellery you’ve been wanting to. A precious metal’s worth is always based on its purity as the price that you pay is directly linked to it. According to ministry of consumer affairs, hallmarking is the official recording of the proportionate content of precious metal in gold. Bureau of Indian Standards (BIS) is the accreditation agency which certifies and hallmarks gold jewellery and other precious metals in India. Hence, before buying jewellery you should always check the hallmark and the number corresponding to the purity of gold. A hallmark mentions karat, stamp of BIS, year of hallmarking and jeweller’s identification mark. Karat denotes the percentage of purity. For instance, 24 carat, or 24K, has 100% gold content. Similarly, 23K would mean 95.8% purity (denoted by 958) while 22K means 91.6% purity or 916. Besides this, stamp of BIS means that the jewellery has been assessed and hence you can be sure of the purity. BIS also stamps the year of hallmarking the jewellery. Jewellers also carry their personal hallmark which includes year of make and purity of the metal. Making charges are nothing but the amount that you pay for the labour involved in making a piece of jewellery. Labour charges are usually a percentage of the current gold price. This means higher the price of gold, higher would be the making charges. Also the more intricate the design, the higher will be the charges. Making charges normally range between 6% and 25% of the cost of gold. Some jewellers offer fixed making charges on purchase of ornaments in bulk. Generally, bangles and chains attract the least making charges, between 6% and 14% of the cost of gold. This charge can be bargained considering it is not organized. You can get up to 10% discount on making charges. Though you may find jewellery studded with precious or semi-precious stones prettier than one with just gold, remember that it will be more expensive. When you buy jewellery studded with stones, it is weighed along with the stone and you are charged accordingly. Also it is very difficult to check the purity of stones, especially semi-precious ones, unlike that of gold. While you have to forgo the making charges of all jewellery pieces at the time of selling, in studded jewellery the stones are actually taken out to determine the weight of gold used. Says Mehul Choksi, chairman and managing director, Getanjali Gems Ltd, “Always ask for the exact net gold weight if you are buying gold jewellery studded with stones." Most studded ornaments involve intricate patterns and designs. 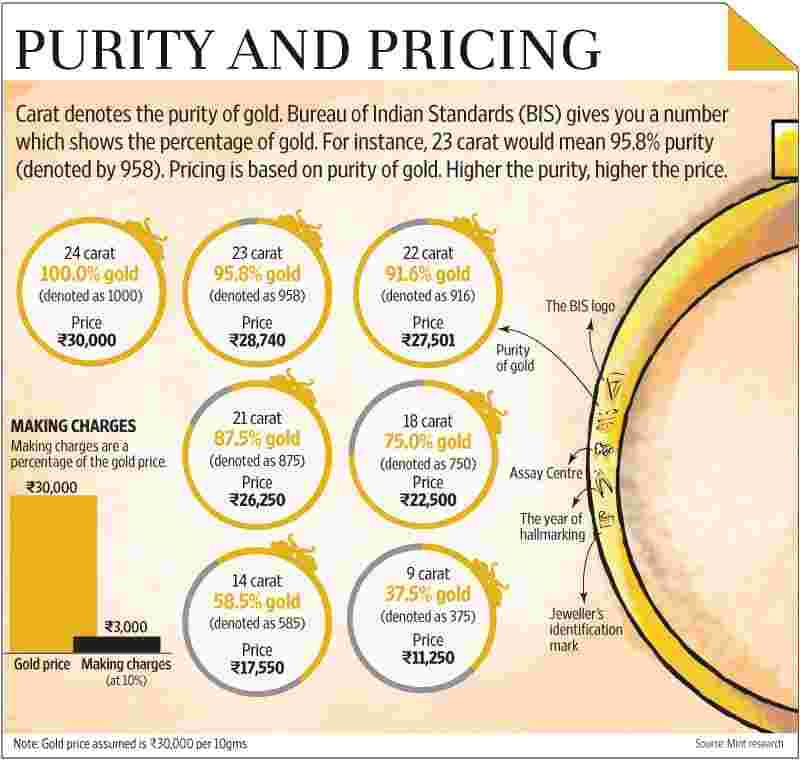 Hence, the making charges are usually higher compared with a pure gold piece. Gold prices have increased. Government’s various measures to curb gold imports can be one of the factors. For instance, in September the import duty on gold jewellery was increased to 15% from 10%. The government on Wednesday hiked the import tariff value of gold—the base price at which the customs duty is determined to prevent under-invoicing—to $442 per 10g in line with global prices of the precious metal. Hence, it has become even more important to check the worth of every bit of money you spend. Gold pricing is determined on the purity of gold. The price of gold changes every day based on the market rate. Most jewellery shops display the bullion rate as on that day. However, before visiting the shop it would be good if you do a quick check on the day’s rate to avoid any kind of fraud. If 10g gold costs 30,000 at bullion rate, the price of 22K gold will be 27,501. Branded shops as well as local stores have buy-back offers for jewellery. Says R.K. Sharma, executive director, PC Jewellers, “Always ask details about the buy-back policy. For every jeweller it is different. Some give entire amount for the weight mentioned while some give only 90% of the value." Generally if you go to the same jeweller, he may give you the entire amount for the weight mentioned. However, if you take the piece to another jeweller, he would first check the purity of gold and then decide its resale value. Remember that all jewellers deduct making charges at the time of sale. Hence, if you keep a tab on things such as certificate of authentication, purity, making charges and buy-back offers, you will be making a smart buy this festive season.